Full length protein corresponding to Human PTEN aa 1 to the C-terminus. WB: HeLa, MCF7 and 293T cell lysates. IHC-P: Human breast carcinoma and colon tissues. ICC/IF: HeLa cells. Our Abpromise guarantee covers the use of ab170941 in the following tested applications. WB 1/1000 - 1/5000. Predicted molecular weight: 47 kDa. Immunocytochemistry/ Immunofluorescence analysis of HeLa (Human cervix adenocarcinoma epithelial cell) cells labeling PTEN with Purified ab170941 at 1:100 dilution (2.6 µg/ml). Cells were fixed in 4% Paraformaldehyde and permeabilized with 0.1% tritonX-100. 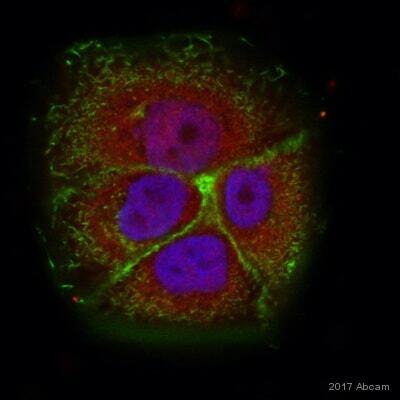 Cells were counterstained with Ab195889 Anti-alpha Tubulin antibody [DM1A] - Microtubule Marker (Alexa Fluor®594) 1:200 (2.5 µg/ml). Goat anti rabbit IgG (Alexa Fluor®488, ab150077) was used as the secondary antibody at 1:1000 (2 µg/ml) dilution. DAPI nuclear counterstain. PBS instead of the primary antibody was used as the secondary antibody only control. Immunohistochemistry (Formalin/PFA-fixed paraffin-embedded sections) analysis of Human pancreas tissue sections labeling PTEN with Purified ab170941 at 1:50 dilution (5.3 µg/ml). Heat mediated antigen retrieval was performed Perform heat mediated antigen retrieval using ab93684 (Tris/EDTA buffer, pH 9.0)ImmunoHistoProbe one step HRP Polymer (ready to use)was used as the secondary antibody.Negative control:PBS instead of the primary antibody.Hematoxylinwas used as a counterstain. Lanes 1 and 2: Merged signal (red and green). Green - ab170941 observed at 47 kDa. Red - loading control, ab8245, observed at 37 kDa. Unpurified ab170941 was shown to specifically react with PTEN in wild-type HAP1 cells. No band was observed when PTEN knockout samples were used. Wild-type and PTEN knockout samples were subjected to SDS-PAGE, ab170941 and ab8245 (loading control to GAPDH) were diluted 1/500 and 1/1000 respectively and incubated overnight at 4°C. Blots were developed with Goat anti-Rabbit IgG H&L (IRDye® 800CW) preadsorbed (ab216773) and Goat anti-Mouse IgG H&L (IRDye® 680RD) preadsorbed (ab216776) secondary antibodies at 1/10,000 dilution for 1hr at room temperature before imaging. Immunohistochemical analysis of paraffin-embedded Human breast carcinoma tissue labeling PTEN with unpurifed ab170941 at 1/50 dilution. Flow Cytometry analysis of HeLa (human cervix adenocarcinoma) cells labeling PTEN with purified ab170941 at 1/120 dilution(10ug/ml) (red). Cells were fixed with 80% methanol and permeabilised with 0.1% Tween-20. A Goat anti rabbit IgG (Alexa Fluor® 488)(ab150077)(1/2000 dilution) was used as the secondary antibody. Rabbit monoclonal IgG (Black)(ab172730) was used as the isotype control, cells without incubation with primary antibody and secondary antibody (Blue) were used as the unlabeled control. Immunohistochemical analysis of paraffin-embedded Human colon tissue labeling PTEN with unpurifed ab170941 at 1/50 dilution. Publishing research using ab170941? Please let us know so that we can cite the reference in this datasheet.